APPLE VALLEY, Minn. (CNS) — When Allen Diaz’s girlfriend — who is pregnant — visited Pregnancy Choices pregnancy help center in Apple Valley last year, it led to more help for Diaz as an expectant father than he could have imagined. 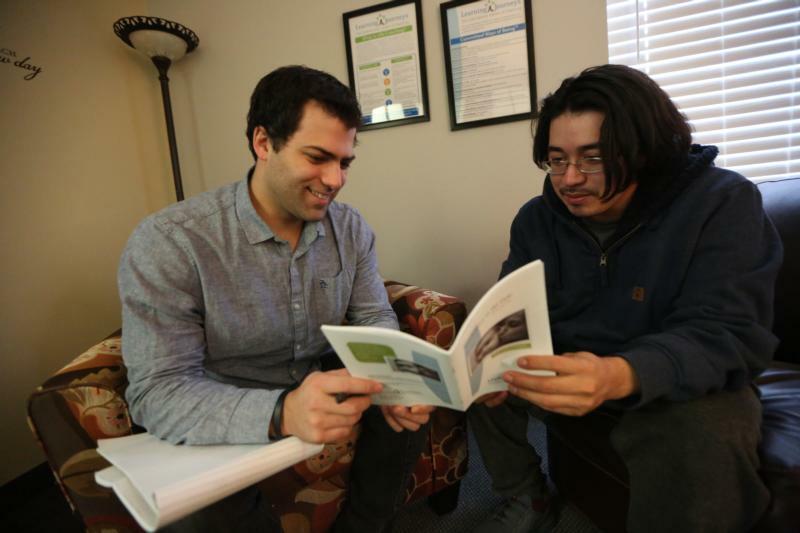 “It helps a lot when you’re a new father, and on top of that, they give you a lot of very good tips,” said Diaz, 29, who participated in Pregnancy Choice’s life coaching program for expectant fathers. Pregnancy Choices, part of the Elevate Life network of centers serving clients with unexpected pregnancies, is the only pregnancy resource center in Minnesota with a paid certified life coach for fathers, according to Vaunae Hansel, who is president of Elevate Life. The program helps fathers prepare for their new responsibility and support the mother. Luke Spehar, the center’s certified life coach, has been working with fathers for the past two years. When Spehar began working with Pregnancy Choices, he said he couldn’t find any men’s ministries at other pregnancy help centers to learn from. Also a professional Catholic musician, Spehar came to Pregnancy Choices looking to volunteer, but he was asked to become a life coach because of the growing presence of male clients coming with their partners. “We kind of have had to blaze a trail with it so far,” Spehar said. That trail has complemented Pregnancy Choices’ work with its female clients, executive director Becky Hanel said. Expectant mothers receive coaching from a certified female life coach, who helps clients make decisions toward their goals. Spehar said life coaching helped Diaz support his girlfriend when she had hesitations about continuing the pregnancy. Diaz and his girlfriend are expecting the baby in April. Coaches at Pregnancy Choices go through 150 hours of training in six to 12 months to receive accreditation from an international coaching school. Both male and female clients meet with their coaches for eight sessions. Coaching is about asking the clients “powerful questions” that help them discover what they really want, Hanel said. “They can see that they’re not in harmony (with their values) when they’re considering abortion, and many times it’s the first time that they thought about the impact of that decision, in that they’re acting in a way that doesn’t align with who they want to be,” Hanel said. For fathers, that process often begins when they arrive at Pregnancy Choices with the mother for an ultrasound, or when the mother is informed about the coaching program for fathers. The number of men seeking coaching has increased enough that Pregnancy Choices recently hired a second coach, Hanel said. The staff has seen that the fathers are “very interested and eager to participate in the pregnancy and really begin to see what their role is,” she said. Diaz said the coaching sessions were about discovering for himself what he could do as he faced an unexpected pregnancy. Part of the fathers’ program entails video education on topics such as anger management, parenting, babies’ sleeping safety and car seat safety. Spehar also can draw on his own experience as a husband and father of two if the clients have questions for him. Spehar sees the need for more pregnancy help centers to reach expectant fathers and for the whole pro-life movement to better uphold the dignity of fatherhood. Hanel sees fathers as having an irreplaceable role in families and helping mothers in unexpected pregnancies move forward in raising their children. She noted that the biological father will always be the father of the child, no matter what happens in the relationship.